Who said, "If you can write, get work." ? It's an honest question. I don't know the answer, though I once did. It sounds kind of Dorothy Parker-ish. Maybe it was Dorothy Parker's mom. I feel so lost when Google does not have the answer, or more likely several thousand answers. And what's the right way to punctuate a sentence like that? That's the name of a biographical documentary film on and by Harlan Ellison. I just caught it on the Sundance Channel, and it will be shown a few more times in the coming week. The DVD will be released on May 29th. I would imagine the point of the multiple showings is to stir up some interest in the DVD. It worked; I have pre-ordered it from Amazon. It looks like there are enough extras on the DVD to make it worthwhile (as opposed to just saving the main film on the DVR). Full list at the Amazon page. Plenty of Ellison talking; some partial readings; archive film of old interviews and appearances. Reminiscences of youth in Ohio, being a target of bullies. He describes how a child cannot explain the irrational to an adult: but there is no logic to bullies picking on someone. "Why you? Well, why in fact not me?" And the awful feeling, "like an icicle jammed into my chest," when his mother said, after one such attack, "You must have said something to get them angry." An early exposure to the problem of evil, and the futility of attempting to rationalize it. All this and a lovely yet unobtrusive score, composed and performed by Richard Thompson on acoustic guitar, with some multitracking. Update: Michael Totten, posting at Instapundit, has linked to an excerpt on YouTube. There are more. At Climate Hell, Steven Milloy lays out a corrupt pattern of conflicts of interest. » Rewarding electric utilities for selling less electricity. Names are named, interests are disclosed. Thanks to Planet Gore. And see below, Lomborg on Climate-Industrial Complex. Bjørn Lomborg had a piece in the WSJ last week that made some important points. The tight relationship between the groups echoes the relationship among weapons makers, researchers and the U.S. military during the Cold War. President Dwight Eisenhower famously warned about the might of the "military-industrial complex," cautioning that "the potential for the disastrous rise of misplaced power exists and will persist." He worried that "there is a recurring temptation to feel that some spectacular and costly action could become the miraculous solution to all current difficulties." This is certainly true of climate change. We are told that very expensive carbon regulations are the only way to respond to global warming, despite ample evidence that this approach does not pass a basic cost-benefit test. We must ask whether a "climate-industrial complex" is emerging, pressing taxpayers to fork over money to please those who stand to gain. This phenomenon will be on display at the World Business Summit on Climate Change in Copenhagen this weekend. The organizers -- the Copenhagen Climate Council -- hope to push political leaders into more drastic promises when they negotiate the Kyoto Protocol's replacement in December. The partnership among self-interested businesses, grandstanding politicians and alarmist campaigners truly is an unholy alliance. The climate-industrial complex does not promote discussion on how to overcome this challenge in a way that will be best for everybody. We should not be surprised or impressed that those who stand to make a profit are among the loudest calling for politicians to act. Spending a fortune on global carbon regulations will benefit a few, but dearly cost everybody else. Several pages of comments at Opinion Journal Forum. The Climate Industrial Complex is the most dangerous organization in the world, and in my judgment is up there with Fascism and Marxism as dangers to Western Civilization. 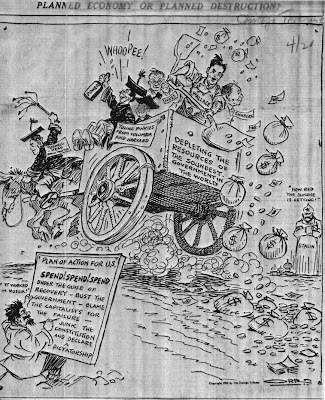 Those latter two are still around and still a danger -- indeed, some Greens use tactics they could well have learned from the Brown, Black, and Red terrors; and note that most of the Climate Industrial Complex program (which will transfer a trillion dollars and more to the Greens without any noticeable benefit to the civilization) is also the agenda of powerful factions of the US Congress and the Administration. It is hard to discern what Obama really believes, but he appears to be a convert to the "consensus". Nature isn't cooperating and it's getting harder and harder to support parts of the "Climate Change" belief system, but the movement is so far advanced that it may not matter. When Roosevelt tried to end The Great Depression, one of his tools was TVA and the generation of energy. Without lower energy costs we will not climb out of our depression. It is important to make it clear that the debate is not over, there is no real scientific consensus on man-caused global warming, and destroying the economy in order to reduce CO2 output in the United States is all cost with almost no benefit. That debate must continue; and you may be certain, absolutely certain, that those who try to keep this a debate will be labeled "deniers" and denigrated as fools. BEIJING (Reuters) - Rich nations should cut their greenhouse gas emissions by at least 40 percent by 2020 from 1990 levels as part of a new global climate change pact, China said on Thursday, spelling out its stance ahead of negotiations. The pact must ensure wealthy nations "take on quantified targets to drastically reduce emissions," said the statement, issued by the National Development and Reform Commission (www.ndrc.gov.cn), which steers Chinese climate change policy. Developed countries should also give 0.5 to 1.0 percent of their annual economic worth to help other nations cope with global warming and curtail greenhouse gas emissions, China said in the document, laying down demands for a conference in Copenhagen in December meant to seal a new climate change pact. Might as well ask for the moon even if all they want is a little piece of the green cheese. But with the watermelons currently in the government, they are likely to get all that and more. Somebody said, "The Constitution is not a suicide pact." But a treaty demanding a 40% reduction in carbon output, that is a suicide pact. See what I mean? They want to ram this through before cooler heads (Hah! Cooler!) have a chance to get into the discussion. … is in the same kind of danger that it faces in Canada. Remember the hearings held by the Human Rights Tribunals against Mark Steyn and Ezra Levant last year, briefly mentioned here at the time, now recounted in Levant's book Shakedown. Now Mark Steyn draws our attention to a similar case in Ireland, in a Corner post titled Cockles and Muzzles. Kevin Myers, my old comrade from my Irish Times and Sunday Telegraph days, is undergoing an experience that sounds very familiar to yours truly. The National Migrant Council reported me to An Garda Siochana [that's Oirish for "the coppers"], demanding a criminal prosecution for incitement to hatred, with a no-jury court, and four years imprisonment the possible outcome. Hans Zomer of Dochas reported me to the National Press Council, on numerous grounds. Tell me about it. What's at issue here is a sustained attempt to criminalize opinion — or, at any rate, opinion which dissents from liberal dinner-party orthodoxy. The misstep was probably inevitable, given the many compari­sons made between Barack Obama and Abraham Lincoln. With seven weeks to go in Obama's presidential campaign, the young candidate from Illinois inadvertently committed one of the most common sins in American politics—he used a phony Lincoln quote. "Abraham Lincoln once said to one of his opponents," then-senator Obama asserted, "'If you stop telling lies about me, I'll start telling truth about you.'" William Randolph Hearst, who ran for governor of New York in 1906, also liked that line. But it was Republican senator Chauncey Depew, another prominent New Yorker, who is actually the first person known to employ a version of the phrase to bash his opponents back in the 19th century. I was surprised to learn that the Ben Franklin line, "Beer is proof that God loves us, and wants us to be happy," was originally about wine, and in French at that. More on this: Quote ... Misquote by Fred R. Shapiro at the NY Times. The real reasons for "global warming"
Rubber snakes the answer to ocean energy? What do I know. Maybe. At least these operate underwater. It would be hard for Ted Kennedy to complain that they were spoiling his view. Seems unlikely to me. Boats would get hung up in these things. That's just a taste, the whole thing is here. For those who have not laughed and nodded the whole way through The New Hacker's Dictionary, paper or online versions, or its online progenitor, The Jargon File, here is a little bit of exegesis. Found at Eric S. Raymond's own blog site, referenced by commenter Jeff Read in the course of a discussion of the Danish language. It is more than a little convenient for America’s political class to blame deregulation for this financial crisis and the resulting excesses of the free market. Not only does that neatly pass the buck, but it also creates a justification for . . . more regulation. The old Latin question is highly apposite here: Quis custodiet ipsos custodes? — Who regulates the regulators? Until that question is answered, calls for more regulation are symptoms of the very disease they purport to cure. 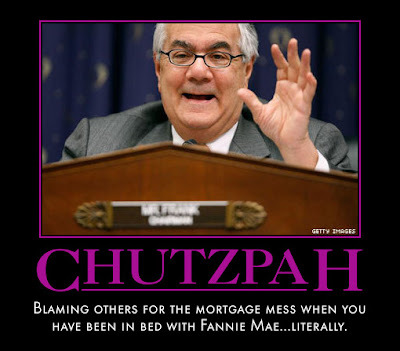 Related: Barney Frank bullying a hedge fund. That was back in October, though, before the change in administrations. Now that the President is doing the bullying, the old Latin question will be even less likely to receive an answer. And some comments at Althouse. I think I'll try changing the title of this thing from time to time. Using the title of the novel is insufficiently subtle; it should be something more allusive. I won't change the URL, or URI if you prefer that terminology, so all the links should still work. Let's see what happens. Kids looking a little green when they come home from school? More than 7,000 schools, churches and others have ordered a DVD version, and hundreds of teachers have written Ms. Leonard to say they have assigned students to view it on the Web. If you can teach the children that industrial civilization is eeevil, and that the poor, weak government is the servant of the corporations (personification of government is shown shining the shoes of personification of corporations), that will make it much easier down the road to regulate, regulate, regulate. Freedom, it's a bad thing. People are so wasteful, so careless, they are trashing the planet. I heard all this stuff in the sixties. It's just more Ehrlichite alarmist nonsense. Delivering it to children with the endorsement of the school system is officially sanctioned child abuse. The script, in PDF form, with extensive footnotes, is here. Does it mean anything that this production was financed in part by the far-left Tides Foundation? Can Heritage or C.E.I. get something like this into the schools? Would they even try to do that? Spotted at Half Sigma, where the commenters do a good job of demolishing this piece of watermelon propaganda. At Chicago Boyz, reflections on the History Channel show "Life After People." Read the comments, too. The three best visual illusions in the world were chosen at a gathering last weekend of neuroscientists and psychologists at the Naples Philharmonic Center for the Arts in Florida. Go see them. See all the finalists. (The "Tilt Illusion" is not working for me, though the Silverlight test page says it's installed correctly. I don't know.) Thanks to Jonah Goldberg. "If Obama were trying to wreck America as a superpower, what would he be doing differently?" Talking about the state of the British Nanny State. Professor Bainbridge calls this "Grumpy Old Men Speaking Truth to Power." But Power, you know, is not listening. America is headed down the same path, but the UK has gone on ahead. We hear voices drifting back from over the water, crying "Turn back, turn back!" Three videos, about half an hour. Funny and bitter at the same time; a nostalgic eulogy for freedom. TigerHawk, in The audacity of tax: As bad as you thought they would be, calls the proposals "hideous." It's not just that rates are going up. There will be rates in places where there never had been rates before, and reporting requirements that never had been required before. All the Joe the Plumbers in the country will need to spend more time with paper work, less time with pipes. That will lower productivity of everything but paperwork. It will even lower productivity of tax revenue, by applying a reverse Laffer Curve. Now we see what the doubling of the tax-enforcement funding is all about. An IRS agent (or at least an audit) for every taxpayer! Other than the Nomenklatura, who will cheat on their taxes and receive Cabinet appointments. If the main goal of the Obama administration is to fight global warming by reducing America to Haiti's level of prosperity, while sequestering large amounts of carbon in filing cabinets, these proposals are a good start. It’s probably no surprise that most of these bullies are men [say what? - ed. ], as a survey by the Workplace Bullying Institute, an advocacy group, makes clear. But a good 40 percent of bullies are women. And at least the male bullies take an egalitarian approach, mowing down men and women pretty much in equal measure. The women appear to prefer their own kind, choosing other women as targets more than 70 percent of the time. The article has 192 reader comments, most of them substantive; people telling their stories, rather than bloviating or sniping. Though it wouldn't be the Internet without at least a little bloviating and sniping. Emily who took part in the conversation, is that you at comment 24? The debate that never was. What a pity. It would have been a wonderful thing to hear, and a good thing for the world. But embarass a Democrat? Can't be allowed to happen, though the heavens fall. And at Watts Up With That, more story, and a lot of comments. Monckton's comments on Gore's testimony. Monckton did testify, a little, at another time. His written testimony (PDF) is brief and breezy. This letter (PDF) to Markey and Barton, expanding on the written testimony, is neither. For laughs, here's a look at that day at the hearing from an alarmist point of view. Nobody understands exactly what the legislation means in dollars and cents - more on this later - but to experience how it would feel to lower your personal carbon footprint to the size this bill proposes, set the flux capacitor to 1875. That's the last time Americans' carbon emissions matched the goals set by the Waxman-Markey legislation. What, the old DeLorean is up on cinder blocks in the front yard again? In that case you can test drive Waxman-Markey by sailing down to Haiti, because current CO2 emissions are where Waxman-Markey wants America's to be in 2050. Radical environmentalists think such a CO2 level will be heaven on Earth, but the place that has actually achieved it is a nation swimming in bacterial and protozoal diarrhea, hepatitis A and E, typhoid fever, dengue fever and malaria, with 47 percent illiteracy and a life expectancy of 49 years. So excuse me if I remain unconvinced. Iain Murray asks, "Just What Is Waxman-Markey For?" And Kenneth Green points to analysis by Chip Knappenberger showing that even if the whole industrialized world, not just the US, were to go along with Waxman-Markey, "it would, at most, avoid only a bit more than one-half of a °C of projected global warming (out of 4.5°C—or only about 10%). And this is under worst-case emissions assumptions; middle-of-the-road scenarios and less sensitive climate models produce even less overall impact." To sum up: very expensive, entirely useless. The Democrats are moving fast on their agenda, in the hope of getting it all enacted before the general public catches on. British artist Banksy has opened up a pet shop in New York City. It's called the Greenwich Village Pet Shop and Charcoal Grill. Of course there's a website. A little coverage from the BBC. And a blog post. The Wages of Moral Equivalence. Read it all, it's short. Then this: Nuclear Weapons, Israel, and the Obama Administration. And this: Obama's green light to attack Iran. Then go buy some Israel Bonds. The investment might help them free up some money for defense. In advance of Israeli prime minister Benjamin Netanyahu’s visit to the United States on Monday, President Obama unveiled a new strategy for throwing Israel to the wolves. It takes the form of enthusiasm for the United Nations and international interlopers of all kinds. Instead of ensuring strong American control over the course of Israeli-Palestinian negotiations or the Arab-Israeli peace process, the Obama administration is busy inserting an international mob between the U.S. and Israel. The thinking goes: If Israel doesn’t fall into an American line, Obama will step out of the way, claim his hands are tied, and let the U.N. and other international gangsters have at their prey.… By making his bed with countries that have no serious interest in democratic values, the president has made our world a much more dangerous place. It seems the US has joined the UN Human Rights Council, a highly bogus body. Scare Force One: all done? Well then, that was certainly worth all the aggravation. When you think of all the exciting photos they could have released, this is a bit of a letdown. Where are the fleeing crowds, the skyscraper close-ups? Ultimately, the Director did not notify Messrs. Messina or Gibbs about the flyover. When asked why he failed to do so, he did not offer a coherent explanation. He stated that it was not a conscious decision—he did not decide not to notify them. Instead, he suggested that it may have been an oversight. 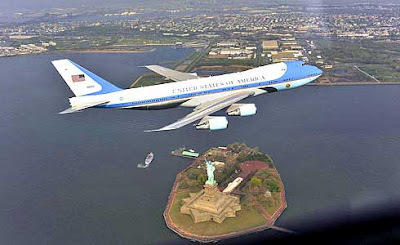 He noted that the Deputy Director had not told him (and he did not understand) that Air Force One would be flying over lower Manhattan at a very low altitude. He then stated that people frequently recommend that he notify Mr. Messina about certain events. Sometimes they are right; sometimes they are wrong. Finally, the Director stated that he was not asked to approve the flight. If he had been asked to make a decision, he would have received a formal package requesting his approval and he would have expected earlier and more extensive discussions with Colonel Turner and the Deputy Director. We also asked the Deputy Director why he did not notify Messrs. Messina or Gibbs. He did not do so for two reasons. First, he believed—based on his discussions with Colonel Turner and the various emails he received—that experienced professionals had planned the mission, and they had taken necessary steps to ensure the public was notified. Second, he believed that the Director would pass the information up the chain of command. This was standard office procedure, and he believed the Director preferred it that way. In this memorandum—based on our interviews with the Director and the Deputy Director, as well as our review of the relevant documents—we have described the facts and circumstances that led to the flyover of New York City on April 27. The purpose of this review is to help you determine whether process breakdowns and/or errors in judgment may have contributed to the incident and how best to prevent a similar incident from happening in the future. In addition, our review suggests that structural and organizational ambiguities exist within WHMO that at times affect the organization's ability to operate effectively. These ambiguities include the reporting relationship of the PAG to the White House and to the Air Force. For example, neither the P AG nor any other Air Force component notifies the White House about routine training exercises. And there are no clear procedures governing the approval process for the use of PAG aircraft, including Air Force One, for operations other than Presidential support. As a result, unusual missions such as the April 27 New York City flyover can be subject to confusion. We believe that WHMO's general structure—and specifically, the reporting relationship of WHMO's operational units (such as the PAG) to the White House and to the Military Service Branches—should be examined. We recommend a comprehensive study resulting in recommendations to the President regarding these structural issues. But it was all Caldera's fault, except that there are structural problems in the bureaucratic structure, which will surely be identified by the ace bureaucrats who will form up a commission to study the structure, and will be careful not to hire Louis Caldera again. It will be interesting to see where he winds up. Is it all under the rug now? Or will there be further revelations, possibly even another photo? Keep watching the skies! Thanks to Gerard Vanderleun, who has a Photoshop, and comments. Update: There is considerably more discussion at Althouse: The Air Force 1 flight over NYC can't possibly have been made for the purpose of taking that photograph. And another post which I dare not name. Does the title above mean that I am escaping from the diptera, or that they, the insects, are getting away from something? A swatter, perhaps? A bat? It's hard to kill flies with a bat, though it's easy to hit flies with a bat, but it's easy for a bat to kill flies. The phrase they wanted was "time flies," of course. But I wonder if the college student contestant knew that the flying in the old saying was running away, or escaping, not necessarily something done at altitude. Time flies like a thief. If, that is, "tempus fugit" had anything to do with it. Or, you could time flies with a stopwatch. There now. Flew, flue, and flu, all in one post. I'm afraid that "Floo" is simply a misspelling, so I won't mention it. No, I won't. Funny how billions just get lost in the trillions being tossed around in Washington. Do you know how much we've committed to backstopping Fannie and its partner-in-crime Freddie Mac (FRE)? $400 BILLION! Back in February that was doubled from the original $200 billion. They just won't quit. Thanks to Glenn Reynolds. The human mind simply cannot encompass numbers that big. Bill Whittle takes a stab at it in this PJTV video, "Mountains of Money." Still, boggle is about all that one can do. The politicians who are slinging this money around like spaghetti at a food fight do not comprehend the numbers, either. The difference between them and normal human beings is that they don't even try to comprehend, so they don't boggle! Then we have Saul Alinsky's Rules for Radicals, another guide to power. Morgan Freeberg gives the list, with commentary, and links to further commentary. Freeberg has another list on the front page today, a Twelve Step Program for Obama Supporters. Again, he gives the list and some insightful commentary, and links to a fuller presentation. This seems to be the day I link to Freeberg. Let me sneak in a bulleted, not numbered, list of "a dozen factual bullet points about the most politically powerful man alive today, the most politically powerful man the world has ever known. Twelve things, each of which, smart-money says you’re learning for the very first time. It’s likely each of the twelve is news to you — that six or more come as a surprise, is a virtual certainty." That's Obama he's talking about. Again, a shortish piece, linking to the full treatment, this time of things the press does not see fit to cover. While on the subject of numbered lists for the ambitious (is this self-improvement, or the reverse? ), one can never fail by linking to a classic, The Top 100 Things I'd Do If I Ever Became An Evil Overlord. Another one I have linked before, but worth revisiting, is Professor Dutch's Top Ten No Sympathy Lines. The relationship between teacher and student is a power relationship, so it's not entirely out of place here. Those who are aware of all Internet traditions have seen this before. I have seen this before. But I don't think I've linked it. By way of Inside the Asylum and Boing Boing, here is May I take your order? This is the sort of thing that if you like, for instance, English As She Is Spoke [that's two links, and I challenge anyone to read either out loud and keep a straight face], you will like it a lot, and it may lead to LOL so intense that pain may result. Be warned. Also, language! NSFW because of language and likelihood of uncontrollable laughter. The comments go on for days, and many are illuminating (about issues of translation), or funny, or both. Sidenote on the power of coincidence: the story referenced in the post below about CFL's was filed by the Times reporter from Foshan, China. The restaurant whose menu is the focus of "May I take your order?" is in Foshan, China. I can assure the reader that there is no conspiracy or aforethought going on here; but will the reader believe me? A couple more of these: Engrish dot com. The clothing, especially. If American hipsters had a genuine sense of the absurd, we would see more of these T-shirts and jackets on the street. The Chinglish Files. This, then, leads us on to Hanzi Smatter, in which we find many examples of bad tattoos. People who do not speak or read Chinese or Japanese do like to get bits of those languages tattooed on their bodies. They take it on faith that the tattoo artist is both knowledgeable and honest. That's a lot to take on faith. The NY Times wrote about Hanzi Smatter, in case you need more explanation than the subhead: "dedicated to the misuse of chinese characters in western culture." [Lower case in original.] Which sounds like they are promoting the misuse, etc. But that's not it, at all. At Hanzi Smatter is a link to a couple of the "flash" charts that tattooists use, the source of their knowledge of Asian script: Gibberish Asian Font Mystery Solved. Related: When LOLCats don't quite satisfy; Look at this hipster. Update: Language Log on another Chinese translation problem: how did the F-word get into so many menus and grocery stores? The Etiology and Elaboration of a Flagrant Mistranslation. Not safe for work, or some homes, either. President Barack Obama proposed on Thursday nearly doubling funds to enforce U.S. tax laws next year, with an aim of more than quadrupling funding for tax compliance to $2.1 billion within five years. Considering the number of tax cheats in Congress, and the high number of Obama appointees with tax troubles, it would make more sense to start looking for better compliance close to home. Just a few extra bucks for the Washington bureau might bring in a fair amount. Related, at Inside the Asylum: Cuba: Obama got it wrong; Iran: Obama got it wrong; now … the Netherlands: Obama got it wrong. Not so much here, though I would imagine that Brandy Bridges may have felt a bit unwell about the $2,000 bill for cleaning up a broken CFL. More in China, where most of them are made. Doctors, regulators, lawyers and courts in China - which supplies two thirds of the compact fluorescent bulbs sold in Britain - are increasingly alert to the potential impacts on public health of an industry that promotes itself as a friend of the earth but depends on highly toxic mercury. More at the link. Via Larwyn at Doug Ross's place. This green road is a rocky one. Fill in the missing words in the headline: Three men attempting a voyage from England to Greenland and back in a 40-foot yacht powered only by wind and solar power were rescued last week by an oil tanker when their vessel received irreparable storm damage. This was intended to be an educational voyage: "Carbon Neutral Expeditions, the organisation behind the crossing, is also working with 40 schools to promote climate change education in classrooms. Pupils will be following the team's progress on daily blogs from the ice cap with web broadcasts on www.green.tv.… Raoul, who is based in London, said: 'Expeditions often achieve impressive objectives and carry out vital research, but few take into account their environmental impacts. By making our expedition carbon neutral, we wanted to show that it is possible to visit incredible places and preserve them for future generations.'" It may have turned out to be even more educational than planned. Somebody tell Jon Wellinghoff about this. Related: Here, earlier, Windjammer round Cape Horn. "[A] a modern vessel needs far fewer crewmen, and the crewmen are much more likely to come home." And at Chicago Boyz, Oil Tanker Saves Environmentalists. Via Andrew Stuttaford at The Corner. No new nuclear or coal plants may ever be needed in the United States, the chairman of the Federal Energy Regulatory Commission said today. How modern the thinking! How very cutting-edge. How very senseless. Wellinghoff has never worked for an energy company. He is a lawyer who has spent most of his life as a regulator and/or "consumer advocate," i.e., one who afflicts energy companies. As industrial civilization spins into crisis, neo-fascist demagogues (Buchanan, Zhirinovsky, for example) offer a return to hierarchical order as the way out. Such alternatives must, of course, be resisted. The third path is ecological democracy, arising "from popular ferment, aspiration for a better life, intolerance of the abuse of power, and collective and personal determination to build a just and enduring community." Only community-based, democratically managed associations have the potential to reconcile human needs for both community and freedom, and to erode the power of industrialism. That part about the "popular ferment" sounds a lot like the French Revolution, and we all know how well that went. Our first task, Daly persuasively argues, is to stop growth. Only after we have stabilized the economy at or near its present size should we determine, and move to, an optimum scale. For one thing, since our survival depends on stopping growth, it is imperative that we do so as soon as possible. Besides, settling such issues as the optimal levels of population and per capita resource use will be difficult, as it will entail searching public debate over such fundamental questions as the present generation's obligations to posterity and reproductive freedom. Achieving consensus on them will be time-consuming. Meanwhile the economy would still be growing and further damaging the ecosystem. Also, making the economy smaller can't be done without halting growth first. Since Daly made this proposal, income and wealth inequalities have exploded. Many large incomes were acquired by gaming the system, e.g., corporation executives paying themselves opulently. This threatens to delegitimize our economic system. What's more, such rapacity sets the wrong kind of example in a limited world. (3) Depletion quotas for resources. The best way to control throughput, Daly argues, is to control the rate at which resources, especially nonrenewables such as fossil fuels, are depleted. Limiting the quantity of resources that enters the economy necessarily also limits how much waste and pollution leaves it. Moreover, since the stock of manmade capital is made from resources, and since the human population depends on resources, controlling the rate of depletion necessarily controls how big the population and capital stock can get. Low cost energy is the key to economic growth, and nothing the government is doing would have as great an effect as a huge nuclear power program. The TVA was the best investment of the New Deal. It may be that private power would have done as well, but the cheap energy from TVA brought energy to the South. Cheap power is the key to growth; and clearly that will not happen under the Change that we can believe in. Hold on to your hats, wallets, kids, and groceries — the Deep Greens are taking over. There will be sustainable and fashionable poverty for all, except the Nomenklatura, who will just have to keep on using those jets and living in those big houses, because their work is so important! The Times evidently did not find this fit to print. There's a paragraph linking to the Post item, buried in a roundup post on the City Room blog, and that's it. So far. Taranto: "Apparently the Obama administration's policy is to release photos only when doing so might pose a danger to national security." If indeed there are any photos. I could not figure out where the camera was supposed to be, and many of the commenters on the linked pieces likewise. "It's not whether it's liberal or conservative, but whether it works." The $18 million savings from canceling the Washington DC school voucher program will make a big difference. Not to the budget, but to the families. Story at Hit & Run. And see School Choice for the Few at the WSJ. Update May 6: A small concession on the voucher program? [T]he administration would keep paying for private-school vouchers for about 1,700 children receiving them in Washington, D.C., an administration official said. Obama is proposing $12.2 million for the 2010-11 school year and would like to continue the funding until the kids in the program graduate. He would not let new students into the program. So if this stands the program will be ended by attrition. This will serve to quiet the parents who currently have children in the program, while closing the door on everyone else. Update: That last article has evaporated, so here are a couple more: In the Washington Times, Rallying for school vouchers: Restore D.C. scholarships, backers urge, and in the WSJ, School Choice for the Few: The new do-as-I-say double standard. Carey Orr in the Chicago Tribune, 1934. Click to see it bigger. Everything old is new again, right down to the "pinkies from Columbia and Harvard." There is a little about the cast of characters here. The fellow down in front there, writing up the plan, looks like Trotsky. Are they fresh, or rotten? If they rise, they are not so fresh. Of course adding ice cubes has always been a way to find the truth about a reporter. Ice cubes and scotch. Thanks to Althouse commenter EDH for pointing to the press "corpse" video. It was in the course of a segment that was announced at the beginning as about torture. Escort81, posting at TigerHawk's place, elicits a lot of comments. That's not all he said. Listening to the full unedited conversation between Stewart and Cliff May of the Foundation for Defense of Democracies requires hearing a lot more Stewart than May. It seems to be the reverse of an interview. Stewart is uninterested in what May thinks, and is too busy preaching to let him speak much. If this leads directly to a terrorist attack on my home city which causes my crushed body to be found under a pile of smoking rubble? I am counting on someone from ML to make sure my gravestone says "she preferred this to condoning torture". Most of the bodies of the 9/11 victims were never found. They were vaporized. The others who died in the pile of smoking rubble might have been more interested in, say, the continuation of Western Civilization than in display of moral superiority. Bill Whittle's reply to Stewart is both fact-filled and heartfelt. This is really a must-see, even if you don't care about Stewart at all. Stewart has apologized, or recanted, or something, about the war criminal remark. It's not much. Glenn Reynolds links to Jules Crittenden: "What are we on, Day 103? I think that Change shark just officially got jumped." Seems that Obama will be reviving the military tribunals for Gitmo inmates, the ones he had previously condemned. That is, for the inmates he does not plan to release onto the streets of the US, with assistance (which would mean cash and what else?) to help them get settled. Via the Crittenden link above, Gateway Pundit: "Al-Qaeda in Iraq leader Abu Omar al-Baghdadi has close ties to the Saddam regime. [… much else …] Remember this the next time you see a mainstream media report claiming there was no links between Saddam and Al-Qaeda." Fox News: "The Obama administration has asked a federal judge to throw out a lawsuit against Iran filed by Americans held hostage at the U.S. Embassy in Tehran 30 years ago." Peter W. Huber: Bound to Burn. TigerHawk calls it "[t]he best article you will read on why it is not merely futile, but counterproductive, for rich countries to struggle to reduce their emissions of carbon dioxide," and has comments. Stages of Denial: Take pity on the left as it grapples with the tea party revolt. Putting MADD in Charge of America's Highways: President Obama's troubling nominee to head the National Highway Traffic Safety Administration. To go with that, The Dangers Of The Drinking Age: The government pressured states to raise it to 21. So why didn't the move save lives? Obama says, "I would love to get the U.S. government out of the auto -- auto business as quickly as possible.… I don't want to run auto companies." Meanwhile, the government is moving even deeper into the auto business: 'Cash for clunkers' kicks in gear. Subsidies at both ends, the sellers and the buyers. That ought to do it! Inline update: Katherine Mangu-Ward at Hit & Run points to a NY Times item on this with a lot of smart comments. Some history: The Assassination of Ngo Dinh Diem, by Peter Kross. More disgusting lefties, indulging in ad feminam about Carrie Prejean: Reynolds links to Hot Air. TigerHawk links to GayPatriot. These videos are not safe for anyone. Partial transcription, and commentary, at the Daily Howler. Did Michael Musto actually compare Carrie Prejean to a "Klaus Barbie doll?" Good grief. Meanwhile — could Perez Hilton possibly be embarrassed? If not why this copyright fight with Patterico? A little analysis by S. Weasel, and a little more by Vanderleun. 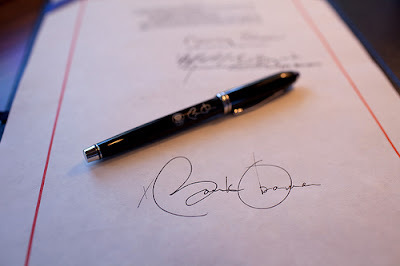 Note that the pen bears a replica signature of its own. These will make great collectors' items. What do you reckon they will go for on Ebay? I'm a little confused by the story and comments at the ProJo. Is the pen made in China, or not? At any rate, it's a $125 item, without the engraving, which is extra, of course. So the $100 million to be saved by economizing on office supplies is not coming from Oval Office supplies. Update: There might be a graphologist. Thanks to Althouse commenter Almost Ali. Sing today we may, we may, for cruel Winter's gone away. If that doesn't make you feel good for a few minutes, I don't know what will. Last year's May Day post.